To speed your enrollment, have your paper bill, banking information, and an email address available. Choose Enroll under New Users. Enrollment will take just a few minutes. If you have a new account, you must receive your first bill in the mail before you can create an online account. Once enrolled, you will be able to view a summary of your recent bills and pay any that are outstanding. Immediately. Your User ID and password are active immediately following enrollment. To access additional accounts with one user id, you will need your paper bill for the account you want to add, Click "Accounts" from the top menu bar. Enter Account number and Invoice number. What happens to scheduled payments if I delete a Waste Connections account from my enrollment? Scheduled payments will still be processed. If you do not want this to happen, you should cancel any scheduled payments prior to canceling your enrollment. To cancel, choose Bill Pay in the top menu bar, choose Cancel next to the Scheduled payment under Recent and Scheduled Payments. Once enrolled, you can start making payments as soon as you have a bill due. If you have a new account, you will not be able to enroll or make electronic payments until you receive your first paper bill. You have the choice of suppressing the paper bills in "Update Profile". Be aware, however, that you may still receive one additional paper bill after signing up for this service. How do I cancel my eBilling enrollment? You are able to remove your payment account information by choosing Delete under the Accounts tab on the Blue Menu bar. You can, also, turn off any email notifications by unchecking the boxes under the Notifications tab. Scheduled payments will still be processed. If you do not want this to happen, you should cancel any scheduled payments prior to canceling your account. Do I have to add banking or credit card info? No. You can enroll and view your bill without adding credit card or banking information. However, you will not be able to pay your bills on this website until you have added either a bank account or a credit card to your Payment Accounts. * User ID and Password: Your User ID and password are unique identifiers that only you know. As long as you don't share your user name and password with anyone, no one can view your bills or personal information. * SSL: eBilling uses advanced Transport Layer Security (TLS) which ensures that your connection and information are secure from outside inspection. * Encryption: eBilling uses a minimum of 256 bit encryption to make your information unreadable as it passes over the Internet. * Automatic Sign Out: eBilling automatically signs you out of a session if you are inactive for 20 minutes. Computer security experts advise that you may put your information at risk when you use a public computer for personal business. While Waste Connections uses numerous security measures to protect your personal information on our website, the use of public computers may compromise the security of your information. Public computers include those in schools, libraries, Internet Cafe's, etc. Checking and Money Market accounts: Accepted for all payments. Credit Cards accepted: Visa, Mastercard and American Express (in certain areas). Once enrolled for eBilling, simply sign in and you will see a summary of your Recent Bills. You can then click to "View/Pay Bill" under the Action tab . You will see a copy of your invoice and a pay window. Simply complete the payment information, click "Pay Now", and you're done! Click “Bill Pay” in the top white menu bar then click "Payments" on the blue menu bar. Under "Recurring Payments", choose "Add Recurring Payment". * To initiate the online payment process, you must select a payment date on the payment page. This is the date your payment process will begin. * For your convenience, eBilling will alert you to the next available day you may make a payment. Same day payments can only be made before 1pm Eastern Time on business days. If you try to schedule a payment to "Pay ASAP" but it is after 1pm Eastern Time or on a non-business day, eBilling will alert you to schedule your payment for the next available business. If paying on the due date, payments can only be scheduled to PAY ASAP. * Once due date on the invoice has passed, payments can only be scheduled to pay asap. If you have requested notification, you will receive confirmation email that a payment has been scheduled. You can also view these online. Click “ Bill Pay” in the top white menu bar, your “Recent and Scheduled Payments” will appear on the “Home” page. You can pay your balance in full at any time from your Bank account (checking) or Credit Card (Visa, Mastercard or American Express). eBills are due on the same date as paper bills. Failure to pay by the due date may result in late fees, temporary suspension of service or cancellation of your account. Helpful Hint: Always schedule your payments to occur no later than 3 days prior to your due date. You may cancel a payment as long as it is listed on the "Payment" page (blue menu bar) as "Scheduled". Please remember that failure to pay your bill by your due date could result in temporary suspension of your service. When will my payment be posted to my WCI account? Payments made before 2:00 p.m. Eastern time will be posted to your Waste Connections account within two business days. Payments made after 2:00 p.m. Eastern time will be posted to your Waste Connections account within three business days. However, the payments may take up to 6 days to show online. Is there an additional charge for paying online? No, there is no additional charge for paying online with a check or credit card. However, if your payment is returned as Unable to Pay, NSF, etc from your bank, your local office may charge a Returned Payment Fee. You have the ability to archive older bills from the "Bills" tab on the top blue menu bar. By filing older documents, your profile will become more organized and easier to manage. How do I file my bills? To archive older bills from the "Bill Pay" page, click the "Bills" tab on the blue menu bar, then click the "File" button located under the "Action" column for the bill that you wish to store. You can select multiple bills to archive by checking off each of the boxes beside the "Customer Name". Once all the bills you wish to archive have been selected, click the "File Selected" button at the bottom of the page. The bills will be transferred to "View Filed Bills" under the "Bills" tab (blue menu bar). How do I view My Filed Bills? You can view your archived bills from the "Bill Pay" page, click the "Bills" tab on the blue menu bar, then click "View Filed BIlls". To View or Unfile any of the bills, click the corresponding button under the "Action" column. You can select multiple bills to unfile by checking off each of the boxes beside the "Customer Name". Once all the bills you wish to unfile have been selected, click the "Unfile Selected" button at the bottom of the page. The bills will be returned to the "Bills" tab. User ID: You should choose a User ID that is easy for you to remember. If you forget your User ID click on the "Forgot User ID" link on the Login Page. Enter your email address and click “Send User ID”. Your User ID will be mailed to the email address you provided during enrollment. Password: If you forget your password, go to the Login page and click "Forgot your password". Enter your User ID and click SEND PASSWORD. You will receive a link to change the password at the email address you provided during enrollment. How do I change my name, phone number, or email? Select the "Update Profile" tab on the top menu. All scheduled payments will be cancelled if their status is "scheduled". You must make other arrangements to pay this bill. How may I contact eBilling via the Web or email? To contact eBilling, click the link for "Contact Us" tab on the top menu. What software do I need to use eBilling? You can access eBilling from any computer, laptop or tablet with an Internet connection and a modern web browser that supports new cryptographic standards set by the PCI Sercurity Standards Council. You can read more about those requirements here. If your current invoice has not been paid, please go to "Bill Pay" in the top menu bar. Your most current invoice will be listed under Recent Bills, select View/Pay bill to make a payment. You will be prompted after paying your invoice to set up recurring payments for future invoices, please follow these instructions. If your current invoice has been paid, go directly to "Bill Pay" and select the "Payments" tab in the blue menu bar, to add a recurring profile select "Add Recurring Payment". Be sure to set payment date at least three days before due date to allow for your payment to be processed. 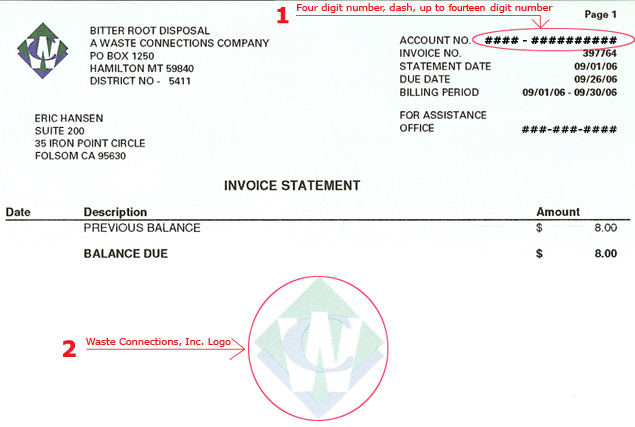 If you have more than one Waste Connections account and would like to be able to view and pay the invoices under one user id, click "Add/Del Accounts" on the right side of the screen or the “Accounts” tab in the white menu bar. You will need your new account number and an invoice number in order to add this account to your profile.